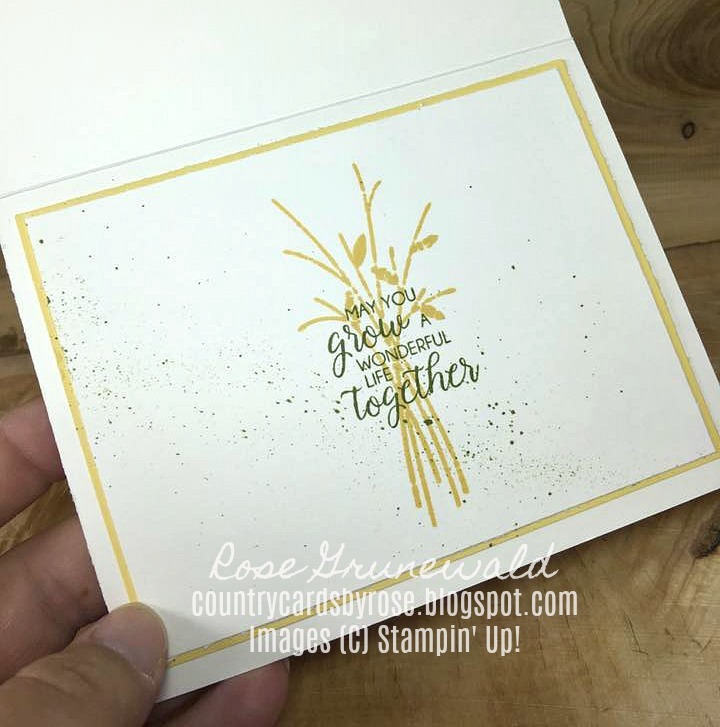 I think one of the best things about stamping is being able to create unique cards that are absolutely perfect for the situation and the friend you are sending them to. My friend Emily is getting married this weekend, and I can't make it to the wedding, but that didn't stop me from creating a card perfect for her. 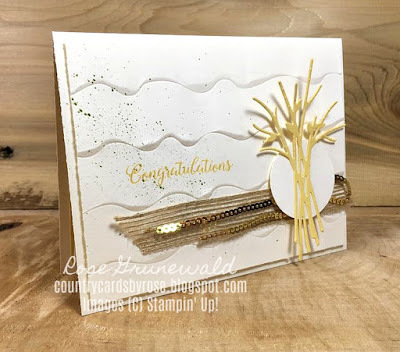 Interestingly, this week's Global Design Project Challenge is a theme challenge, and the theme is wedding or anniversary! What perfect timing! You can read more about the challenge by clicking below. My friend loves to spend time on her family's cranberry marsh and her new husband's family farm. I wanted to create an elegant, harvest-themed card, and immediately I thought of a wheat bouquet when I picked up my Bouquet Bunch framelits. I also wanted my card to be simple, but elegant. 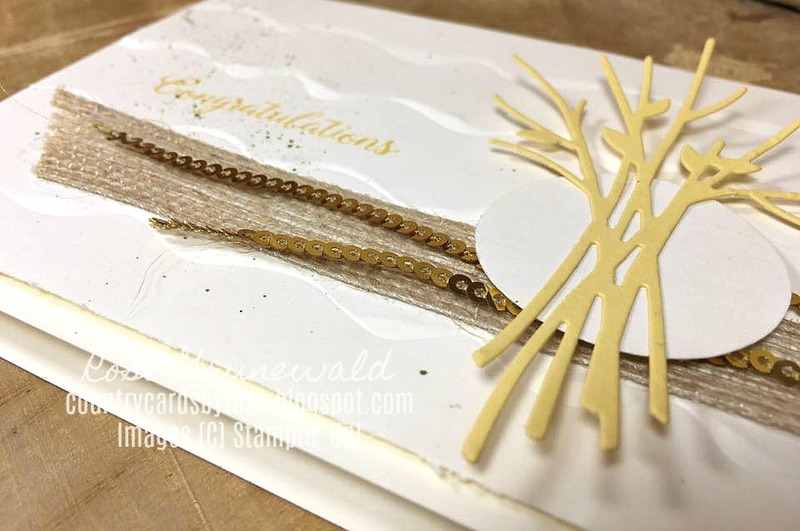 The new Ruffled 3D embossing folder was the perfect choice to create that look. 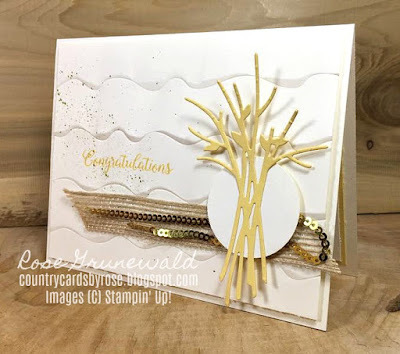 I chose Very Vanilla as my card base and front and a simple color pallette by bringing in So Saffron with the wheat and "Congratuluations" sentiment. The gold mini sequin trim is the perfect pop of glitz, don't you think? I added just the perfect pop of a color across the blank space of this card with a few flicks of my Old Olive Stampin' Write marker, and I carried the Old Olive into the inside of the card too. Isn't that sentiment just perfect for a wedding? That' comes from the Beautiful Bouquet stamp set, and when you bundle with the framelits, you can save 10%! If you don't have a Stampin' Up! demonstrator, I would be so thrilled to earn your business! I love inspiring you with my projects, and all of my customers get an invitation to my private Facebook VIP page where I share exclusive projects with you, we play games, and you can win prizes! Remember to use my August hostess code J3KE9KT6 to get a special gift from me :).